This week's Website of the Week goes to Down The Line Sports for their vibrant, action-packed and welcoming website. Its unique colour-scheme, quirky features and captivating photos ooze enthusiasm for sun, school and sport. It makes for a brilliant browsing experience for anyone looking to learn or improve their game of tennis in a gorgeous location with friendly people. Down The Line Sports offer everything from personal tennis lessons to tennis holidays abroad! They can teach their clients one-on-one or even teach a group of friends on a vacation of their choice. They specialise in children's tennis and even offer the chance for young tennis enthusiasts to stay and train at an academy in Spain. The company is fronted by Rowan Moss, experienced and dedicated coach of every type of student from beginners to experts and children to adults. The company is organised and structured by his wife Nicky Moss, a tennis coach and expert in her own right. Of course, the first thing that catches your eye about this website is the brightly coloured design and custom layout. The yellow, green and orange featured in the logo is used throughout and nicely matches the high-quality, high-impact action shot background. The Header, Content and Footer are nicely separated into different translucent blue sections and are punctuated throughout with delightful photos of the classes Rowan and Nicky have run. The content of this website is also rich with links to other pages from beginning to end and keywords that describe the services that Down The Line Sports offer. This is excellent for Search Engine Optimisation purposes and will ultimately help to improve Down the Line's place in the Search Result Lists so that students and future students will be able to find them quickly and easily, and generate as much online interest for Rowen and Nicky as possible. 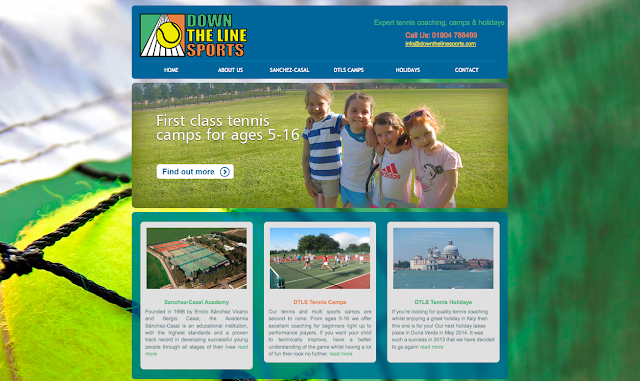 Down The Line Sports were delighted with their new website and expressed tremendous gratitude. "There's nothing to improve on. The friendly professional service is first class. They were super efficient and a real pleasure to work with. Thank you so much!" We at Toolkit Websites were very pleased to hear such kind words and very grateful that Nicky and Rowan chose us for this project. Find out more about Toolkit Websites, Web Design company in Southampton, Hampshire, UK and how they can help your business grow.